Herb Johnson was born November 10, 1920, in Pittsburgh, PA. The son of Swan and Ruth Johnson, he spent his childhood in Astabula, OH. A lifelong amateur radio enthusiast, he designed his first radio at age 14, and at age 15 earned his amateur radio operator's license. After moving to Benson, AZ, he founded Swan Engineering (later, Swan Electronics) in 1961. 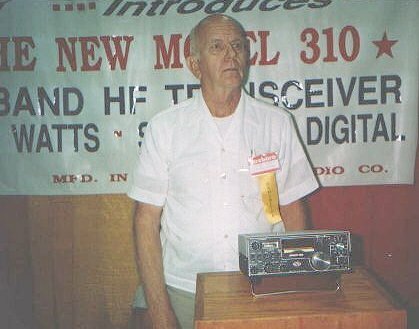 Originally working by himself out of his garage, Herb created a line of radios that became a favorite of amateurs around the world. Herb chose the brand name "Swan" in memory of his father, whose name in his native land of Sweden, was "Sven". Upon arrival in the USA, his name was Americanized to "Swan". Swan Engineering grew rapidly, and its growth continued after Herb relocated the company to Oceanside, CA, in 1962. At its peak Swan produced as many as 400 radios per month. Needing more capital and engineering resources for Swan's rapid expansion, the company merged with Cubic Corporation in 1967 and Herb continued managing the Swan subsidiary until 1973. The Swan line of equipment was mostly tube type design, and through the years more than 80,000 transceivers alone where sold. Many Swan radios remain in service today, a tribute to the quality that went into their design and construction. Herb founded his second company, Atlas, in 1974. Atlas produced a line of compact, rugged radios that became very popular for mobile communications from cars and boats. Herb was particularly proud of the many explorers and adventurers who used Atlas radios to stay in touch with the outside world during their expeditions. Herb was an avid sailor, skippering a series of boats (all named Vector) in numerous long-distance races along the coast of California and Mexico. A longtime member of the Oceanside and San Diego Yacht Clubs, he remained active, continuing his pursuits in amateur radio and sailing, well into his seventies. After a period of declining health, Herb died of heart failure on January 31, 2000. He is survived by his wife, Mimi Johnson; his children Sven Johnson, Tina Svalina, Les Johnson, Eric Johnson, and David Johnson; his step-children Dave Callender, M'Liz McJones, and John Callender; twelve grandchildren; three sisters and two brothers in Ohio; and one brother in Maryland. Thanks WA1RI for your authorisation to publish this picture of Herb on my site!